Many anglers think there’s only one tactic to catch a steelhead: standing in a cold river with numb fingers swinging a big, pushy streamer through a deep run on a blustery winter day. Sure you could do that, and you could even catch some nice fish, but you could also chase summer steelhead in a bathing suit on a bluebird sunny day. 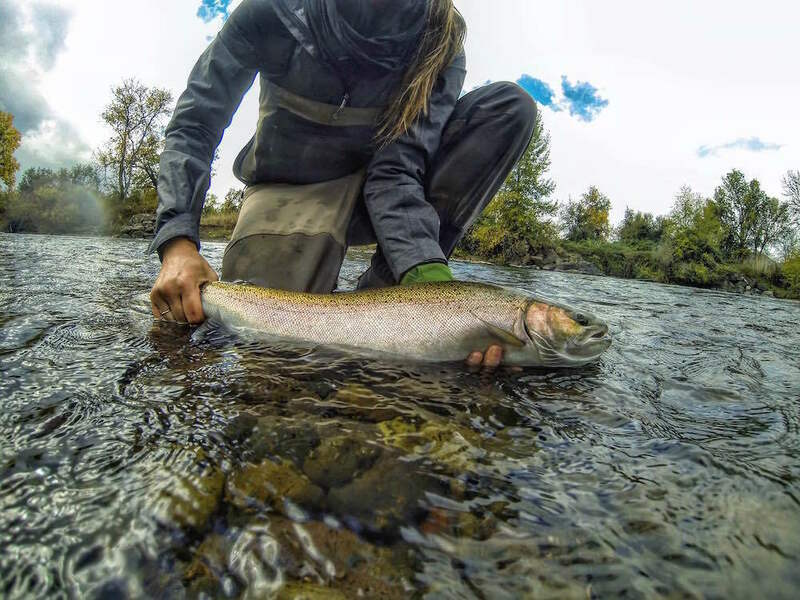 Postfly Ambassador Maddie Filomeo lives in Northern California and got her first taste of steelhead last year. 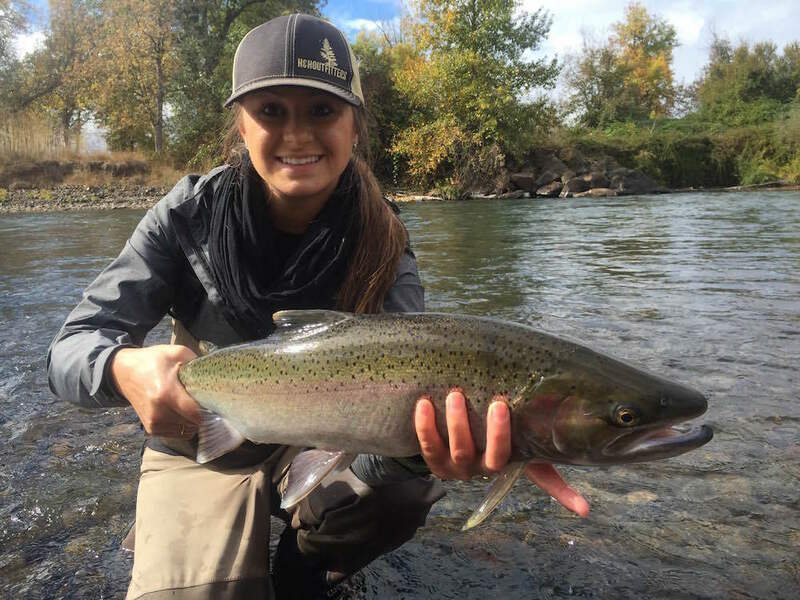 A big time trout angler, Filomeo used her skills chasing rainbows and applied them to getting after some summer steel. “My reaction to catching my first summer steelhead was just pure excitement,” she said. “Those fish are fighters!” Use her tips to get started and get hooked into the best fight you’ll find standing in the river this summer. “My biggest steelhead last year was caught just below a large riffle,” she said. When you’re looking where to cast, remember that steelhead are still rainbow trout, just ones that have gone off and lived in the ocean for a few years. They’ll often hide in the same spots as rainbows, albeit larger ones since they’re often twice the size, or even bigger. 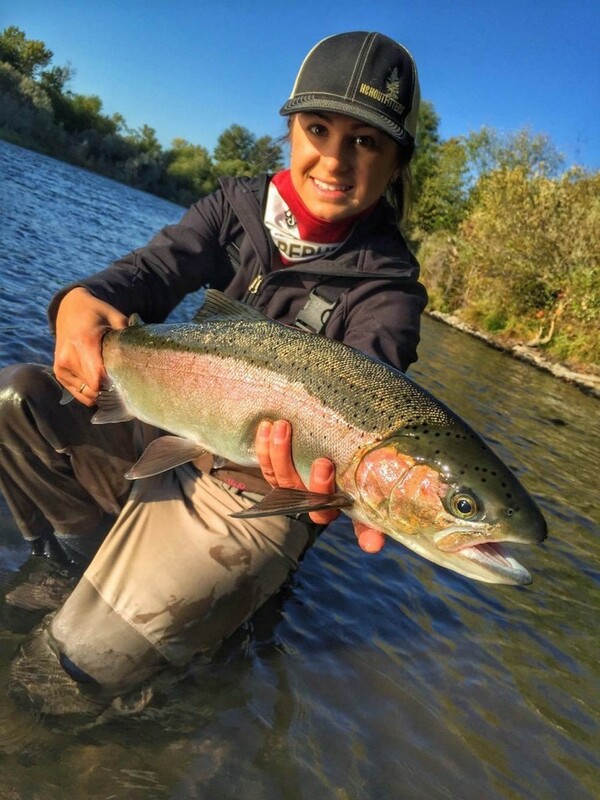 “One of the techniques I learned that was extremely helpful in catching me my first steelhead was using a big, weighted bug with a pegged bead as a dropper,” said Filomeo. Experiment on bead colors until you find the one that works best for your local fishery. “A cloudy peach bead or even the occasional chartreuse bead worked best for me,” said Filomeo. Just like those winter steelheaders, swinging your presentations is an effective way to catch summer fish. Cast at a 45-degree, downriver angle and let your fly line swing out and away from you in the current until your line is pointing downstream. “For those people who like to swing, black and blue intruders seem to work well year-round,” said Filomeo. Letting your line hang straight downriver is called a dangle; how long you choose to let the fly soak like that is up to you, but most anglers prefer to recast shortly after the line goes straight. However long you chose, just be prepared for the strong tug that has hooked so many anglers on these strong, beautiful fish. Tired of running out of the right steelhead fly? Subscribe now to become a Postfly Tribe Member and never run out of flies again.